 Mounted on a solid wood plinth of hand-finished English ash. �Winston Churchill The Artist� has been sculpted to exacting detail, from the lines on Churchill�s face to the hairs of the paintbrush in his right hand, from the signet ring appearing on Churchill�s finger of the right hand to special details of the siren suit Churchill wore while painting. Lady Mary Soames (Churchill�s youngest daughter and sole surviving child) and Ms. Celia Sandys (Churchill�s granddaughter) provided advise, recommendations, and criticism throughout all phases of the project to insure perfection in every possible way. 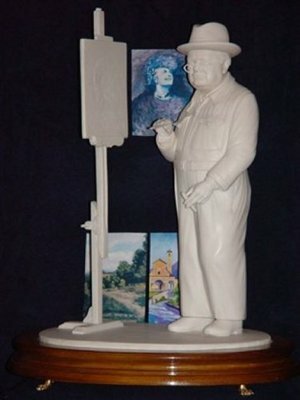 Lady Soames commented upon completion, �This is my father.� The image sculpted on the easel�s canvas is a likeness of the portrait Churchill painted of his wife, Clementine (a reproduced photocopy of the original portrait appears in the background in the picture above). 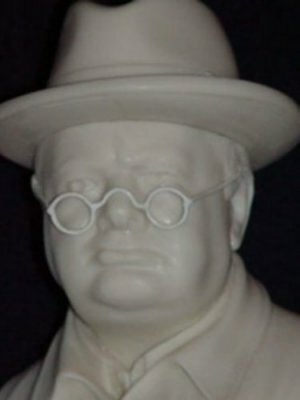 The overall result is that �Winston Churchill The Artist� is the finest contribution to Churchilliana ever produced and, indeed, can be expected to represent the showcase piece in any Churchilliana collection.